"Justice is the best beloved of all things". My photo/text pieces, Give and Take and The consequences deal with this. The apple could be 'the snare', the material that is either trapped or possessed but for me it is the 'giving and taking' that is really the trap: our motive. I chose a postcard as the form for this artwork because postcards are things often given and received. Often as souvenirs of exchange rather than as objects in themselves. 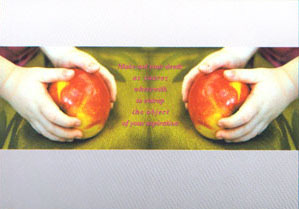 It is open ended whether the apple is given or taken, mirrored or doubled, or the child's part in the transaction. For me, justice, is about everyday acts, and not so much about heroic moments. What happens when you give and take? Is that compromise or wisdom. Is that what justice means? Is the child giving or taking, owning or offering? postcard, 10 x 15 cm. to entrap the object of your aspiration"
The text warns us to consider our motives, particularly when we do something nice for someone. It warns of making something that is essentially spiritual (trust / manaakitanga) into a possession, but that emphasis is on the positive: it just says, be careful about your motive when you give. It's ironic that we often think of justice in the context of injustice. computer print, 10 x 15 cm. are as dire as those of lying. 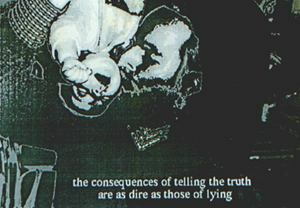 In The consequences, a man kisses a baby, and the text warns us that telling the truth is as risky as telling lies. By presenting this 'saying' in this manner, the viewer is encouraged to question what is meant by 'truth', and where is the 'risk' in what seems a harmless ordinary act. To the Is-land by the New Zealand author, Janet Frame. In both pieces I deal with the issue of justice from the perspective of ethics and questions, because justice, at least in this day and age, is much more complicated than the principle of an 'eye for an eye'.